A parliamentary report of 1777 recorded local workhouses in operation at Chew Stoke and at Radstock, each accommodating up to 12 inmates. County of Somerset: Cameley, Camerton (2), Chelwood, Chew Magna (2), Chew Stoke, Chilcompton, Clutton (2), Compton Marton, Farmborough, Farrington Gurney, East Harptree, West Harptree, Hinton Blewitt, High Littleton with Hallatrow, Litton, Midsomer Norton (3), Nempnett Thrubwell, Norton Hawkfield, Norton Malreward, Paulton (2), Publow, St Thomas in Pensford, Radstock (2), Stanton Drew, Stone Easton, Stowey, Timsbury, Ubley, North Widcombe(2). The population falling within the Union at the 1831 census had been 22,377 with parishes ranging in size from from Norton Hawkfield (population 40) to Midsomer Norton (2,942). The average annual poor-rate expenditure for the period 1833-35 had been £9,172 or 8s.2d. per head of the population. A new Clutton Union workhouse was erected on a steeply sloping site near Temple Cloud to the south of Clutton in 1836-7. The Poor Law Commissioners authorised an expenditure of £6,690 on construction of the building which was to accommodate 300 inmates. 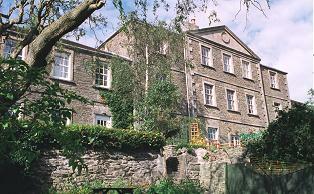 It was designed by Jesse Gane who was also the architect of the Shepton Mallet Union workhouse. His design for Clutton was somewhat unusual. It comprised a south-facing entrance block, with a central block at its rear. Further buildings at the north formed a semi-hexagonal arrangement more usually associated with the popular "Y" plan. The workhouse location and layout are shown on the 1903 map below. 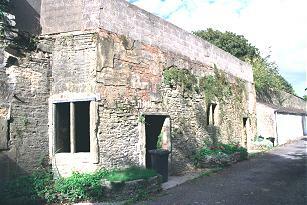 Clutton entrance block from the south-west, 2000. Clutton remnants of central range from the south-west, 2000. Clutton northern perimeter from the south-east, 2000. 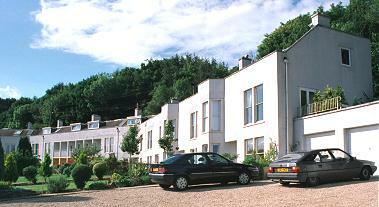 After 1930, the former workhouse became a Public Assistance Institution known as Cambrook House. Somerset Heritage Centre, Brunel Way, Langford Mead, Norton Fitzwarren, Taunton TA2 6SF. Holdings include: Guardians' minute books (1836-1930); Admissions and discharges (1841-1916, with gaps); Births (1839-1933); Deaths (1838-1927); Baptisms (1874-1929); Creed register (1875-1930); Offences and punishment book (1851-1904); etc. Griffiths, Ken (2005) Workhouse: Brief Glimpses of the Poor Law and life inside Clutton Union-house (Fiducia Press).